More new and fun clothing to collect for 2014 and 2015-all seasons. You can now find shirts at GAME, NEXT and Asda, as well as other stores. You should be able to find several of the items on this page at Marks & Spencers also. Unfortunately some of the online stores only ship to EU addresses so keep it in mind before you order. Reminder: *Always* check the size before bidding on Ebay, these may range from tiny-kid to regular adult sizes, depending on the maker/where you buy. 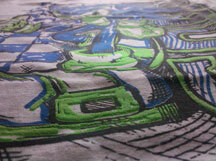 Remember the first 'Green Hill' tee? Here comes another, but it uses more of the level's background to decorate the shirt. This time there are 2 floating pieces of land, sunflower, palm tree & rings. Sonic is an art rather than a sprite (as to be expected) and is also far too large for the background, so that he stands out on the shirt. This was found at Marks & Spencers in 2011. Here's a gray hoodie sweatshirt with red interior. It has no zipper or pockets. This one makes use of some interesting / uncommon art for both Sonic & Shadow. They're both shown somewhat horizontal like 'flying through the air' style poses after a jump, and are placed going in opposite directions. Is this a Sonic X piece of art they've adapted? Either way, because the art is so unusual, this sweat shirt will stand out in a collection. This could be found at Sainsbury's but the sizes are unknown. Here are 2 shirts that are merely a variant on eachother. One is blue with gray sleeves (and uses the shirt color for Sonic) the other is red with black sleeves, and uses ink to color Sonic. They're both the same size graphic of Sonic X's "Jumping Punch Sonic" and both were found at NEXT stores in 2009. What exactly is going on with this shirt? The photo is so tiny that it 's hard to tell. They're using a modern/2011 stock art for Sonic but he's on some sort of black splash backround with dots? It's hard to tell. If you have a larger photo of this, send it in for credit! Here's a rather plain offering from NEXT. It uses a re-draw of classic Sonic stock art, but only adds these odd colored 'wedge shapes' or triangles or something around him, and his feet as well as the logo. What are these supposed to be? The shirt comes off as rather standard/plain because of the older art and little sprinkles of color that aren't really a design. This could be bought in 2010 & 2011 at NEXT stores. This is a boys pajama/pyjama set with 2 pieces. The top is just a white tee with colored triangles scattered all over and a neo-classic Sonic jumping stock art. The logo appears in hot turquoise. The shorts have the logo in the same color as well as a fun accent stripe for the legs. The matching color is also picked up amongst the triangles. With both of the pieces together, they make a good match and the design stays interesting. Found at TU. This is a rather strange shirt from Sports Direct. It has an all-blue flat color Sonic graphic, but then shades / zelously uses the "burn tool" to darken out parts of it for some reason. Like looking at a cardboard in the dark. The background seems to have different colored...glows? Lights? Airbrushed round things in greenish, yellowish and reddish/pink. The logo appears in white at the bottom. Exactly what the effect they were going for here, is unknown. This came in sizes 7 through 13. This shirt has a rather modern & clean feel, with the white fabric, various simple but large blue squares & modern jumping twist Sonic. He's large & stands out well, along with the logo. This small yellow shirt is a kids piece from Tesco in 2009/2010. It has a stack of Sonic's name in blues & red, with thumbs up modern Sonic down the side. Here's another tee from Sports Direct, however this one's design makes more sense than the last. It has hot green & pink paint spatter background, with a great big modern Sonic art. This could be bought at Tesco stores. 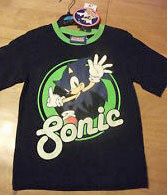 This is a blue tee for little kids (note shirt proportions) It has the neoclassic jumping Sonic stock art, with ring background, lines and 'sparkle' stars. The classic logo is a good size, but doesn't seem to intrude.This was at Marks & Spencers. How unusual! This is a girl's tee (see how long it is?) that also uses the rare color purple. The shirt is all purple, and the art is pink. It's the neoclassic jumping Sonic again, this time was a line-art only & little stars. The color combo here is bright & stylish. This was made by SportsDirect. This shirt uses an interesting layout of colored pannels to draw attention to various Sonic classic stock arts including running, steamin', spinning, forward-facing & the drawn version of the 'Sonic died' sprite. A row of colored stars is at the top, while the logo is in pink at the bottom.This was made by SportsDirect. Yet another fun Free Riders shirt. This one has Sonic on his board, with Shadow standing in the background. Shadow is wearing his riders goggles, though. The FreeRiders logo is at the bottom, and the whole thing really stands out on the bright yellow short-sleeve. 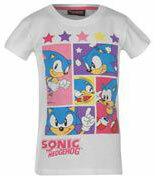 The grid background going from white to black adds interest to this classic Sonic stock art long-sleeve. This could be found at Debenhams, and also has a version in red. 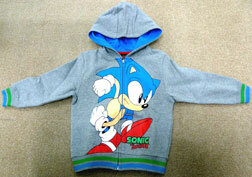 Another hooded sweatshirt to feature Sonic & Shadow. This time Sonic is shown jumping, while Shadow is running forward. The interior here appears to be blue, but you can't tell if it has pockets. 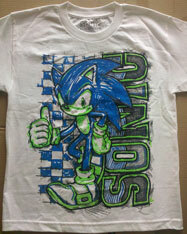 This is a plain black shirt with the thumbs up Sonic from Sonic X. But where's the logo? This was found at Dunnes. Here's a long sleeve tee with the faux-double sleeve effect. It has neoClassic Sonic & Knuckles art, with pointing finger Sonic & fists-together Knuckles. The background is green & red scribble-line...however red wasn't the best choice, because Knuckles' head sort of fades into it due to where he's placed. The classic logo sits at the top right. This could be bought at Marks & Spencers. This shirt from NEXT in 2009/2010 is rather odd, in that it doesn't appear to be 'designed' at all. Stock art just looks pasted onto it for several characters in a grid pattern. Looks like something you might see in an instruction manual, and seems somewhat plain. You ca spot Sonic, Tails, Knuckles, Eggman, Shadow, Silver, Jet, Omega & Vector. The shirt itself is white, not yellowish as shown here, it's just the tint of the photo. It's great to see Omega on a shirt though. This red shirt from Asda is rather simple. It uses classic running Sonic, & the classic logo for the art. It's also pretty small too (likely little-kids) as seen by the proportions here. Striped shirts aren't all that common for Sonic tees, but here's a nice one with yellow horizontal stripes. It turns the modern logo sideways to nice effect, and has Sonic jumping out of a circle, to help break up the stripes. What's going on here with Sonic & Shadow? They appear as CG graphics, but what are those yellow things? Explosions? Scribbles? If you've got a larger photo, be sure to send it in for credit. This is a rather simple shirt. It's bright yellow, and pretty small. 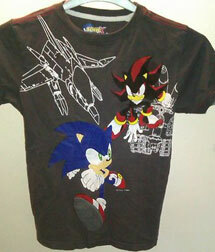 It features Sonic & shadow with overlapped stock art, & the modern logo in black. This can be found at Asda. It's a bright shirt with a solid design, if you don't already have something similar. Here's a colorful long sleeve tee that's not too busy. It's in the faux-double shirt style, with black 'tee' and white long sleeves. The design is a nice big modern Sonic jumping in front of pale blue, aqua, green & yellow checkers, with a few drippy 'paint splats' thrown in. 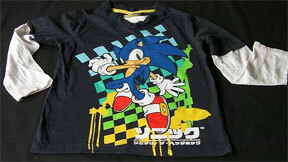 It has Sonic's name in Japanese at the bottom right corner (which is sort of unusual for UK items, it's more common on USA ones) Where is this shirt sold? Do write in if you have seen it. This was sold in fall 2012.
green collar makes this shirt stand out. But what company made it/ where can you get it?